Especially Samsung galaxy battery draining quickly so a large number of Samsung people facing the draining problem. In the series of Android problems and solutions, today we are going to see; how to fix android battery drain issues? Android OS Marshmallow/ Nougat 6.0.1 battery drain fix, quick tricks for fixing poor battery life on smartphones in Lollipop or KitKat and also discuss on removing system hogging apps, extending battery life, unknown problems that are draining your battery in the background and going to learn new smart ways to improve your mobile battery life. In today’s world, with 4G/5G handsets by the latest mobile operating system upgrades and new technology Qualcomm chips in the market, it is indeed difficult to keep track of the battery level on your smartphone. Smartphone companies like Samsung, One Plus even now have battery issues in their flagship phones. Of course, the sporting specifications better than some laptops today will certainly push the lithium-ion battery to its limits. Having said so, that is not the end of hassle-free smartphone experience. It is widely known that heavier apps drain the battery faster. And if you left the GPS turned ON for overnight in addition to Wi-Fi, you’ve had it. Probably because of this, users getting huge battery drain fast especially with Oreo/Marshmallow. Moreover, the screen timeout and brightness as well affecting the battery life. The 25% usage for the display brightness itself is the sign of a healthy battery. Even though if you see, in recent years, Samsung phone battery life problems are considerably issued and so the Samsung Smartphones have come up with the ultra-power saving mode, it makes the phone fit only for calls. For the longer battery life possible, try to manage your battery between 20 and 85 percent. Avoid letting phone battery totally discharge, and don't charge it from 0% up to 100% too often. 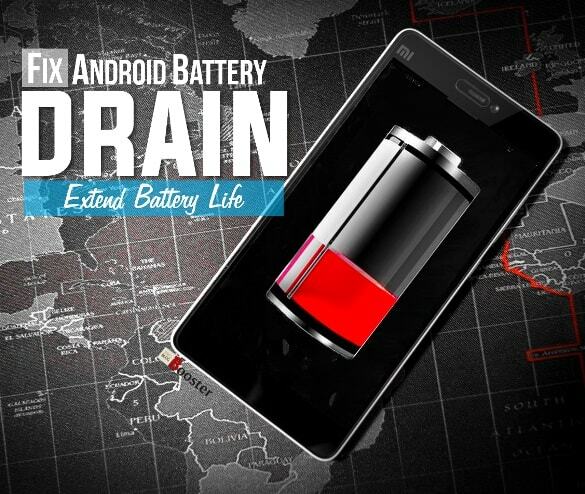 Let's check out the quick ways for Android battery draining fast fix & to solve battery draining problem in Android OS. In the previous article, we have seen Top 5 Mobile Operating Systems | Mobile OS Options and today we are going to see how to cope up with the Android battery problem and how to fix these Android errors. Most of the people used to search; How fix a battery that is discharging? How to extend battery life? Why is my phone battery draining when not in use? How to fix LG phone battery dies quickly free? How do you fix your phone battery? How do I keep the Android system from draining the battery? How do I find out what is using my iPhone battery? And here is the post that will help to solve these questions very quickly. 1. Spot & kill battery draining apps. Apps that use screen-overlay – for example, messenger by Facebook consume a lot of power as they are active even on the user interface of other apps. This happens because the processor has to do twice the amount of work. Live wallpapers of higher frame rates drain the battery like nothing else. So do widgets, especially the ones that feature round the clock, e.g. weather forecast. 2. Turn ON power saving. This Power-saving Mode of Android enables the users to forcibly put those apps into an idle state that shouldn’t be awake. However, some apps need to be run at all the times for delivering maximum performance. You can choose not to ‘optimize’ such apps. You may do this for mainly critical applications like those for travel or be managing an account — only realize that more often than not, the framework will handle these capacities precisely as you need, with the additional advantage of optimizing them for battery saving. Most Android smartphones come with a general power saving mode. In some smartphones, it gets activated as soon as the battery percentage reaches 15%. Phones having ultra-power saving mode limits the smartphone to just texts and calls – not so that much smart now. Both these methods help in extending battery life. 4. Keep low brightness & turn OFF auto brightness. Sensors that detect amount of light falling on the screen consume a lot of battery power. Turn off automatic brightness in Settings, and you won’t be able to believe the difference it makes in increasing your battery life. 5. Cope up signal strength. If your phone falls in the low network coverage quite frequently, the phone will have to work harder to bind itself with weak signals. Hence keeping your smartphone in airplane mode when you don’t need to make calls or text is a wise move. Disable haptics. The capacity of your device to vibrate to caution you of another call or notification is remarkably valuable, however, it needs to generate enough energy from the battery to make your entire device shake. 7. Always use updated apps. Go & update your applications now. Applications regularly get redesigned to utilize less battery power, so you ought to ensure your applications are auto-updating mode. Regardless of the possibility that you've opted for automatic updates, some applications still require that you physically install updates. Check for application upgrades in Google Play by pressing the menu key and heading off to My Apps. 8. Battery packs vs power banks. There is likewise the notable Android OS bugs, which causes a large amount of battery consumption for no clear reason. Some have bound it to the wake lock, which basically keeps your device from saving power, in this way expending a great deal of battery. To prevent this battery depletion, some recommend disabling 'Back up my data'. To disable it, you have to find your Backup option inside your Android settings. Once you've found the button, disable it and Restart. On the off way that, there are still issues, you can simply attempt to wipe your device's cache (not factory reset) - Hence erasing the cache clears old and undesirable background information that is not being utilized - don't stress, clearing your cache won't delete any of your data. To do this, you just need to turn off your device and enter recovery mode, by holding up (or down) on your volume button and the power button all at the same time. Select the option to clear your system cache and after that reboot your device. Ideally, this will overcome the wake lock issues. One can overcome Android battery issues by knowing the Mantras as told to you. Practicing them in your daily life will remove the burden of ‘low battery’ from your mind. Remember shutting services like Wi-Fi, Bluetooth, NFC, 4G LTE, and so on that don’t need to be running at all times. With phones exploding in today’s world, one can try to at least keep up their battery levels – at the same time not overcharge them. If you happen to own a device that supports dash charging, you won’t find putting your phone to charge all that monotonous. Also, remember carrying an extra battery can come in handy sometimes – of course, only for those users who own replaceable - battery smartphones.